The 20th century saw remarkable advances that revolutionized the health conditions of most of humanity. In industrialized countries, life expectancy increased 30 to 40 years during the century, and most low- and middle-income nations experienced even more dramatic gains in health, longevity and quality of life. Life expectancy in India, for example, doubled during the period. Yet, the World Health Organization (WHO) estimates that more than 1 billion people, especially in developing countries, entered the 21st century without sharing much in these gains. This is, in part, because many developing countries are facing epidemics of chronic diseases alongside persistent, though receding, diseases of poverty, such as nutrient deficiencies, infections and childhood mortality, according to WHO. It is now well established that diet and nutrition play a central role in both chronic and poverty-related conditions, but unfortunately even the most astute scientists and statesmen often miss this key detail. In fact, the epidemiological transition of the 1900s resulted in a major shift in leading causes of premature death and disability around the globe: from infections and malnutrition (our traditional enemies), to heart disease, cancer, Type II diabetes, obesity and other so-called chronic, lifestyle-related, or non-communicable diseases (NCDs). NCDs are currently the leading causes of death, disability and disease worldwide, except in sub-Saharan Africa. And WHO and the World Bank project that, while the major NCDs in 2001 accounted for nearly 60 percent of all deaths, this toll will rise to 73 percent by 2020. Similarly, according to the Global Burden of Disease analysis, which compares the burden of different diseases on the basis of disability-adjusted life years (DALYs), the burden from NCDs is expected to rise from the 46 percent recorded in 2001 to 57 percent by 2020. This means that the rank order of the global disease burden in 2020 will also substantially change: Ischaemic heart disease will become the leading cause of disease burden, followed by cerebrovascular and chronic obstructive lung disease, among other conditions. At the same time, many of the infections and nutrient deficiencies, including those that affect child survival, have already decreased, and will become even less prevalent, according to Drs. Christopher J. L. Murray and Alan D. Lopez. Today, coronary heart disease is the leading cause of death worldwide, responsible for 30 percent of all deaths; meanwhile, 79 percent of all chronic disease mortality is occurring in developing countries, according to WHO. In fact, for adults under the age of 70 in India, China and sub-Saharan Africa, the probability of dying from heart disease is already greater than for their Western peers. And developing countries face double jeopardy. Infants who survive malnutrition, infection and low birth weight appear to be predisposed to reduced stature, Type II diabetes, and a host of respiratory, musculoskeletal and cardiovascular conditions in adulthood, according to research by D. P. J. Barker. Urbanization is a major culprit in the NCD epidemic. More than half of the world’s population is expected to be urban by the next decade, with about 70 percent of this urban population – more than 2 billion people – residing in developing countries, according to a 2002 report by B. M. Popkin. As economies develop, populations tend to migrate to urban areas. As seen in North America, Latin America, Central and Eastern Europe, and Asia, urbanization and affluence precipitate the adoption of the mistakenly called “affluent diet,” which is high in meat, fat and sugar, and often accompanied by a lifestyle involving alcohol consumption, cigarette smoking and little physical activity. While this transition and prosperity tend to reduce malnutrition, such diets and lifestyle pose their own health risks. In fact, world trends in the past half-century demonstrate that as gross national product (GNP) rises, cereal consumption decreases and the intake of animal protein, animal fats, and added fats and alcohol increases. While the urban diet is generally more diverse than the rural diet and contains more micronutrients and animal proteins, it also has much less plant foods and fiber, and much more refined carbohydrates, processed foods, and saturated and total fat. Meanwhile, modern technologies, such as computers, have led to more sedentary work habits. In a prospective study of some 4,000 Chinese age 20 to 45, for example, Popkin and colleagues found that, between 1995 and 2000, the proportion of adults using less energy to do the same job substantially increased. And a decrease in energy expenditure at work is significantly correlated with increased body mass index and, consequently, obesity, Popkin concluded in 2002.
Leisure activities have not only become more abundant, but also more sedentary, particularly with the penetration of modern transport and mass media, even in the developing world. Perhaps this is exaggerated, but some report that, by 1997, about 70 percent of Indian and nearly 100 percent of Chinese households owned a television set. With such changes in diet and lifestyle, as the GNP approaches $3,000-4,000 per capita and life expectancy exceeds 50 years, the burden of cardiovascular disease and cancer begins to mimic that of countries that have an average income that is three times greater. In other words, modest increases in prosperity in populations with a low GNP tend to create a rapid and marked increase in several chronic diseases. This pattern emerged in the United States in the 1920s, and in developing countries in the 1970s. In developing countries, NCDs tend to emerge at a younger age and initially appear among the affluent, as they are the first to embrace a “Western” lifestyle. Obesity and Type II diabetes are good examples of the challenges presented by NCDs around the globe. Almost one-sixth of humanity – 1 billion adults – are overweight, at least 300 million of whom are obese, according to 2003 WHO data. Today, more than 60 percent of American adults are overweight, with half of them obese, and obesity rates in American children have trebled over the last two decades, revealed a 2005 U.S. Department of Agriculture/Department of Health and Human Services report. Overweight and obesity pose a major risk not only of Type II diabetes, but also of cardiovascular disease, hypertension and stroke, and several forms of cancer. They lead to an overall reduction in the quality of life, and an increased risk of premature death. Even in many historically agrarian lower- and middle-income countries such as Mexico, Egypt, India and South Africa, obesity, Type II diabetes and cardiovascular diseases currently affect 25 to 50 percent of the population, according to studies by I. Aboderin and colleagues, and Popkin. Once predominantly a disease of the old, Type 2 diabetes has been increasing in all WHO regions, and striking younger people. And WHO projects that of the more than 300 million diabetics estimated by 2025, three-fourths will inhabit the third world. In essence, health policy-makers in this century confront a dual challenge: halting the escalating NCD epidemics around the world, while simultaneously confronting NCDs and infectious diseases, childhood and maternal mortality, and undernutrition in developing countries. Most industrialized nations learned too late that preventing NCDs is much more cost-effective than treating them. But, developing countries still have the luxury to learn from these mistakes. Fortunately, chronic diseases are largely preventable, and there is strong scientific evidence that behavior modification comprising a shift to healthful diets and a healthy lifestyle can largely prevent them. In May 2004, WHO’s World Health Assembly endorsed a Global Strategy for Diet & Physical Activity, which outlines a comprehensive global health agenda with goals and objectives and a policy framework for achieving behavior change, the fundamental goal of which is risk reduction. The report underscores the importance of prevention of chronic diseases, stating that treatment would place an intolerable economic burden especially on developing countries, where treatment of NCDs has to compete with prevention of diseases of poverty. In the last two decades, many countries have set national public health goals and objectives, developed a policy framework for health promotion and disease prevention, and put into place an implementation strategy that includes health programs, public education, and monitoring and assessment. But many more nations need to develop a prevention-based approach with strong emphasis on implementation. Of course, most guidelines (e.g., in India), also address other issues, such as undernutrition. In the past three decades, similar recommendations have come from authoritative groups in different parts of the world, and they show a general consensus on what needs to be done. To guide consumers, dietary guidelines are often accompanied by food pyramids and other educational materials to reflect the hierarchy as well as the quantity of foods. There is also remarkable similarity in food pyramids from around the world in the last decade, and most of them target overall health, such as America’s new My Pyramid, with different colors for each food group. 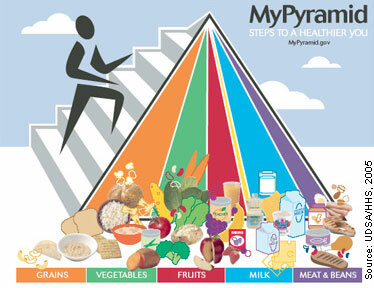 The Mediterranean Diet And Physical Activity Pyramid is another example of a pyramid for overall health promotion. Vegetables, fruits, grains and other plant-based foods occupy the most space in these pyramids. To translate dietary guidelines into practical steps, there needs to be collaboration among the many partners and stakeholders, including nutrition and health professionals and educators, health-care providers, professional associations, the industry, media and consumers. Together, they must create a positive environment that empowers individuals, families and communities to change behavior. For example, the food and beverage industries must be persuaded to ensure that healthy food choices are available and that there is effective food labeling to guide consumers. And the advertising and entertainment media should work with health professionals to produce persuasive and unambiguous messages for different age groups. Naturally, there are many challenges to implementation. Policymakers tend to underestimate the effectiveness of interventions or assume that there is a long delay in achieving any measurable impact. Sadly, WHO’s global diet and physical activity strategy has confronted many barriers, and so far, less than half of WHO member states have implemented or plan to implement the recommendations. Many do not appreciate the social and economic cost of chronic diseases; for others, political priority and commitment are low; and still others simply have inadequate resources for chronic-disease prevention. And then there are commercial pressures. For example, in several countries, including the United States, recommendations to reduce salt, sugar and fats conflict with the interests of the food and beverage industries. Nevertheless, evidence exists that the NCD epidemic can be halted through prevention. For developing countries, this means philosophical and financial commitment, instituting public health policies and programs, and spending more on NCD prevention. In North America, Western Europe, Japan and Australasia, where NCDs have dominated the national health agenda for many years, active and sustained intervention in the diets and behaviors of populations has produced dramatic decreases in risk factors and premature death rates from heart disease and some tobacco-related cancers. This was achieved by linking communities, governments, food production and processing industries. In North Karelia, Finland, for example, age-adjusted cardiovascular mortality dropped dramatically between the 1970s and 1995, mostly because dietary change, combined with community action and consumer demand, resulted in lowered plasma cholesterol and blood pressure. South Korea has largely maintained its traditional high-vegetable, low-fat diet and reports lower rates of chronic diseases and obesity compared to other industrialized countries. So, although the overall disease burden and disability remain high in industrialized countries, the epidemic of chronic diseases can be halted, and appreciable changes can occur rapidly. 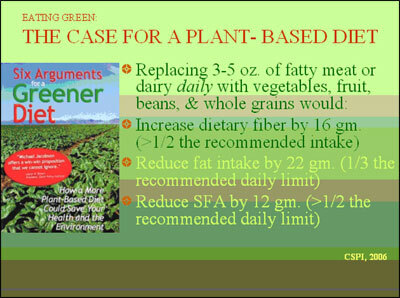 How much risk reduction can we anticipate with eating green and other recommended lifestyle changes? “Eating Green” doesn’t mean totally giving up animal foods. Rather, the idea revolves around a primarily plant-based diet that is low in fats and fatty animal foods, according to Dr. Michael Jacobson and colleagues at the Center for Science in the Public Interest (CSPI). In making a case for eating green, based on studies it has conducted, CSPI points out that the fats in meat, poultry and dairy cause about 63,000 heart disease-related deaths annually in the United States, that lacto-ovo vegetarians have about 24 percent fewer fatal heart attacks than non-vegetarians, and that one additional serving of fruits or vegetables/day would lower cardiovascular disease deaths by about 16 percent. Meanwhile, according to a 1997 study sponsored by the American Institute for Cancer Research, using the best guess estimate, cancer incidence could be reduced by more than 20 percent with an average vegetable/fruit intake of 400 grams/day – and with just 100 grams more per day, it could be reduced by about 40 percent. Experience in industrialized countries tells us that prevention of tobacco use alone could reduce the global disease burden by nearly 40 percent. And consuming low-saturated fats and plant-based diets, avoiding excess alcohol and being physically active could cut disease risks by an additional 30 percent, according to National Academy of Sciences data. As for specific chronic diseases, some experts estimate that lifestyle changes could yield up to an 80 percent reduction in the risk of heart disease, a 90 percent decrease in Type II diabetes and about a 30 percent reduction in cancers. It is harder to change food habits, but it can be done. In the United States, the print media plays a central role in promoting diet and lifestyle; leading newspapers, including The Washington Post, New York Times and Wall Street Journal, all carried major headlines and detailed stories in the 1980s when the Food & Nutrition Board of the National Academy of Sciences issued reports on diet and cancer, and diet and health. This publicity caught the public eye, and helped pressure the government and Congress to develop policies and put ongoing programs into action. Major campaigns are also underway in many parts of the world to promote vegetables and fruit, or a plant-based diet. 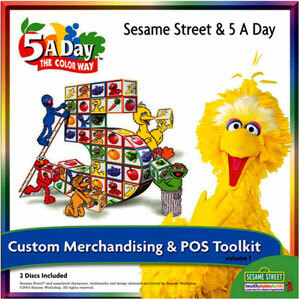 One such vigorous program is the “5-A-Day The Color Way” campaign that started in America in the 1990s and has recently launched in Europe. A coalition of the U.S. National Cancer Institute, the Public Benefit Foundation, the fresh produce and agriculture industries, Wal-Mart and a host of others, including educators, television and other media, Five-a-Day promotes consumption of at least five servings of vegetables and fruits a day using clever and persuasive ads, public service announcements, and promotional materials for adults and children. It has had a small, though measurable, impact in increasing vegetable and fruit consumption in the United States, according to a 2005 article in CECHE’s Global Health & Environment MONITOR by E. Pivonka. The final test of how well mass media or other strategies work is whether NCD rates (e.g., obesity and the growing list of diseases it causes) go down. But interim measures are essential for several reasons: to monitor public awareness and changes in eating habits and lifestyle; to assess trends; to determine the impact of interventions; and to modify intervention techniques, if needed. In the 21st century, developing nations must not repeat the mistakes made by the Western world as it advanced. We have a historic opportunity to halt, or at least to minimize, the epidemic of chronic diseases in developing countries. And experience in industrialized countries tells us that this can and must be done.